DP Series HP Indigo® certified photo papers are manufactured on the same paper machines as the high-quality, resin coated base papers Mitsubishi pioneered for the silver halide photo market. The result is a paper capable of superior photo reproduction with a brilliance and clarity no other paper on today's market can match. Mitsubishi Imaging's DP Series photo papers are available in seven different surface finishes, from 8 mil to 10 mil, and from single sided or dual sided finish for superior photo reproduction. Ideal for a variety of small or high volume production applications. Premium resin coated, luster surface paper reminiscent of silver halide, professional portrait surfaces. It's coated 2-sided luster finish is ideal for fine art prints, greeting cards and posters. Available in two weights. Premium resin coated, enhanced luster metallic paper reminiscent of silver halide metallic papers. It's coated 1-side pearlescent luster finish is ideal for fine art prints, greeting cards and posters. Available in two weights. Premium resin coated, hi-gloss metallic paper reminiscent of silver halide metallic papers. It's coated 1-side pearlescent gloss finish is ideal for fine art prints, greeting cards and posters. Available in two weights. Premium, dual sided, resin coated, enhanced luster metallic paper reminiscent of silver halide metallic papers. It's coated 2-sided pearlescent gloss finish is ideal for photo books, wedding albums and brochures. Premium resin coated, luster surface paper reminiscent of silver halide, professional portrait surfaces. DP Luster 190R is certified for HP Indigo® digital presses. Ideal for geeting cards, posters, brochures and other high-volume photo paper applications. 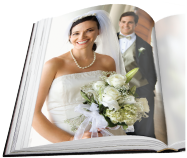 DP Series Dual print photo paper features a superior printing surface on both sides, making it ideal for photo and wedding books.